After your transceiver, the antenna system is the next most important part of your ham installation if not the first one. Without antenna you are condemned to look at the sky instead of taking advantage of its sky waves, Hi ! For the beginner it is not always easy to know what antenna, what tower, what sizing or what rotator to select. 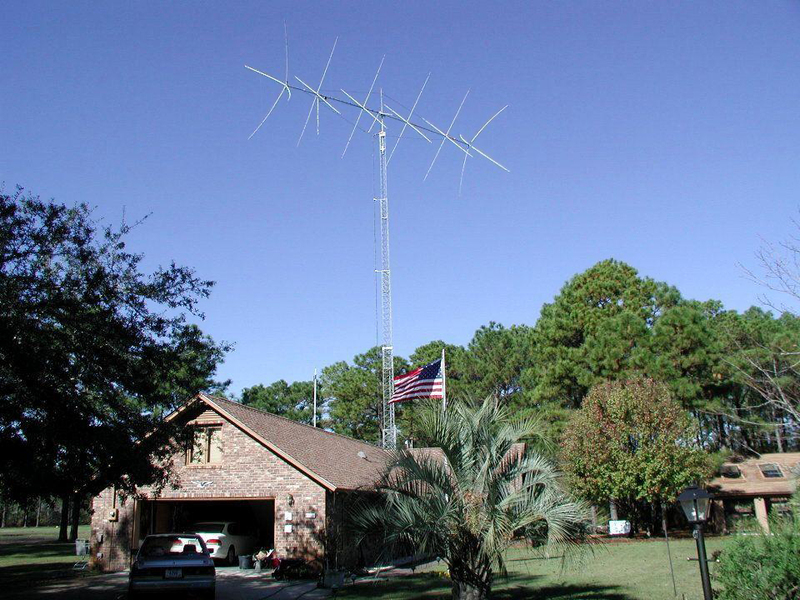 If you decide to install a tower and a respectable antenna, here is a good advice. Visit other amateurs who erected aerials on towers or masts, see how their hardware is installed, and ask them questions : about the ease of handling, whether they installed it alone, what problems they encountered, how they solved them, how all that is grounded, how long last the assembling, where they purchased their material, at what price, etc. It is important that you estimate whether you might handle such a project, and if such an installation can be erected where you want to put it. 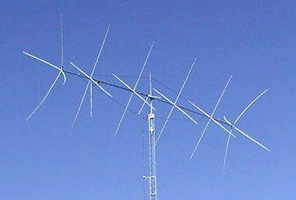 If this task is not too difficult to handle for a simple V/UHF antenna, for the HF bands the scale of the elements to take into consideration has already did move back some amateurs. Indeed, if the choice of a rotating system is not a problem, the size of the tower might be one for different reasons (price, furtivity, authorization, handling, security, etc), so it will quickly become your biggest problem to solve ! 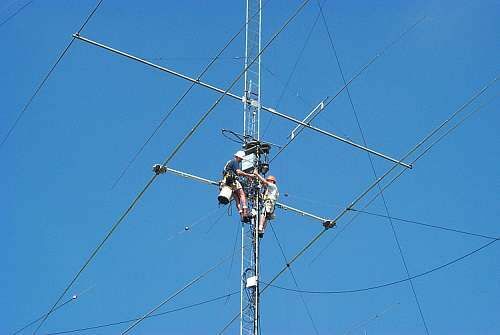 We must thus divide this problem in two parts : first, the requirements to work on V/UHF, then the requirements to operate on HF what will automatically lead us to answer to some questions such as what rotator to select, what tower design is the most resistant ?, how to assembly it ?, how to place the antenna on top ? How to maintain a tower and its elements ?, and how to secure the tower and antenna ? 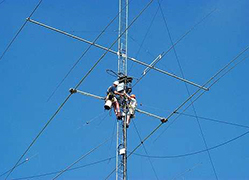 Thousands radio amateurs around the world successfully installed their antenna on top of a tower, so I can already ensure you that this task is in the capability of any amateur, at the condition to work safely, with appropriated tools and know-how, as much issues that we are going to review in this article. - Installing the antenna system. If you haven't bought your rotator yet, I suggest you to read the next page dealing with the selection of a rotating system for our directive array and then come back to this page. Depending on the country in which you live, any construction made of concrete (e.g. your foundations even if they are invisible and will never exceed the ground level) or an aerial erected farther than 60m away from the street (e.g. at the far end of your garden) or at a height exceeding about 10 m (33') above ground like K2US' 6-element home-made quad displayed above (for 20/15m), all these buildings are subject to the approbation - or refusal - of the local ordinances (Cadastre, Town & Country Planning Acts, Municipality administration, etc). K2US' quad. Enlarge to see an overall view. So before embarking you in any major aerial installation, it is advisable to contact your local ordinances and if necessary to apply for planning permission. If it is accepted the permit is usually delivered in a few weeks or after a few months if your building exceed standards (e.g. erected over 60m away for the street, higher than 15m up, etc). Some municipalities will be very restrictive about this subject while others will let you practically erect what you want while respecting your neighbouring. Of course many amateurs do not ask for this approbation from the moment that their backyard or their roof is large enough to erect a beam without disturbing their neighbouring. But this is at your risks if one day a municipality agent knocks at your door requesting your planning permission or showing you a legal restriction for the height of your tower or the wingspan of your antenna. - Ground the antenna, the tower and install a lightning protection. Always interested ? Right ! You are lucky ! Let's see now how to select, assembling and erecting an antenna system. We will imagine that you received all required authorizations, that your neighboors and family are not really irritated or affected by your project, thus it remains to buy the material, get some tricks of construction, and of course to find some money, your main limitating factor after the space available. Here are some basic recommendations if you want erecting an antenna on top of a tower, knowing that this subject can be developed on dozens of pages and has room for experimentation. We will discuss about usual installations, leaving aside the biggest ones that request the assistance of a a crane or even an helicopter... However, do never underestimate such an assembly if you are not used to such a job. We will repeat it at the end of this article, if you are novice in this matter and thus unexperimented or a simple amateur, do entrust this work to a specialized company in high iron work. If you feel confident in this job, go ahead !